Chemung County is rooted in literature and soaring, but it’s the vibrant community and charm that visitors fall in love with. 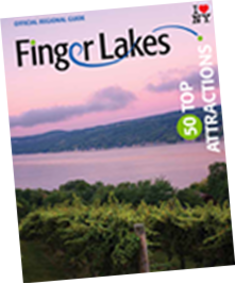 The southern gateway to the Finger Lakes region, Chemung County offers scenic drives through beautiful rolling green hills. Hop aboard the “Elmiran” trolley for a narrated historical tour of the city of Elmira. Known as “Mark Twain Country,” Elmira was the summer home of beloved author Mark Twain for over 20 years. Visit the Mark Twain Study, now located on the campus of Elmira College, to see where he wrote the classic stories of Tom Sawyer and Huckleberry Finn. The octagonal study looks just as Twain left it, deeming it the “#1 Literary Attraction in America” by USA Today. Also, at Elmira College is the Center for Mark Twain Studies, which features an exhibit of Twain artifacts relating to his time in the area. A few miles away is Twain’s final resting place at Woodlawn Cemetery. Experience the unforgettable thrill of motorless flight with a silent glider ride from Harris Hill Soaring Corporation, which Amelia Earhart proclaimed as the “finest gliding and soaring facilities in the country.” Elmira’s significance also comes from holding the revered title of “National Soaring Capital of America,” due to the prominence of soaring through the region’s majestic hills and deep valleys. Next to the runway sits the National Soaring Museum with the world’s largest collection of sailplanes. Chemung County is also noted for its colorful history. Beginning with Native American heritage, Chemung means “place of the horn” in the Algonquin language due to the large mammoth tusks discovered along what is now the Chemung River. A visit to Newtown Battlefield Reservation, a national historic landmark, tells the story of the American Revolution and Civil Wars through reenactments. Discover other historic ties, such as Chemung’s connection to the Underground Railroad or the story of astronaut Eileen Collins, the first woman to pilot a space shuttle. Even Chemung’s architecture and art are steeped in history. Walk down the quaint avenues of the Historic Near Westside Neighborhood, the largest neighborhood of Victorian Era mansions. Visit the neo-classical Arnot Art Museum for a permanent collection of turn-of-the-century paintings paired with temporary exhibits of fine art from around the world. The majestic Powers Theater at the Clemens Center has been restored to its vaudevillian-era grandeur with brilliant murals and gold-leaf details, making it an awe-inspiring location for a Broadway show.